This Scottish dagger is patiently hand-crafted and carved. The handle is and hand-notched for artistic accuracy. 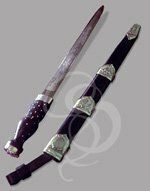 The humped wooden hilt is carved with intricate spiral patterns and mounted with steel studs for that authentic tough-guy-with-class look. The hilt-cap bears the engraving of a Scottish crown. 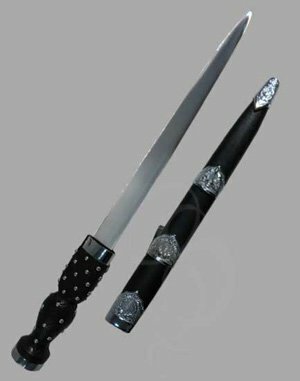 The dagger has a 12 inch high carbon steel blade and measures 18 inches in overall length. A version of the dagger with a tempered blade is also available. The tempered blade can be ordered sharpened or unsharpened. Included is a leather sheath with steel accents. For a small additional fee the blade of the dagger may be engraved with a phrase of your choice. It makes for a fantastic one of a kind gift. The engraving was beautifully done. The SAMS members that I've shown it to were really impressed and wanted to know where to get one. I told them ! You guys are amazing and so helpful! I had extremely prompt response to my email inquiries and I’m very impressed with this dagger. Tempered blade is rock solid and the wood on the handle is great. Love this place. The Scottish Dirk features a high quality build. No loose fittings. The sheath is just as impressive with a snug hold on the blade. The custom engraving met all my expectations and the recipient expressed amazement at the workmanship.